AND don’t let anyone else tell you, that you can’t do it. Once you’ve ignored those things just start taking your first steps towards achieving your goal. If you want it that much you REALLY CAN DO IT! My eldest daughter Jess and I achieved something together we are both very proud of. 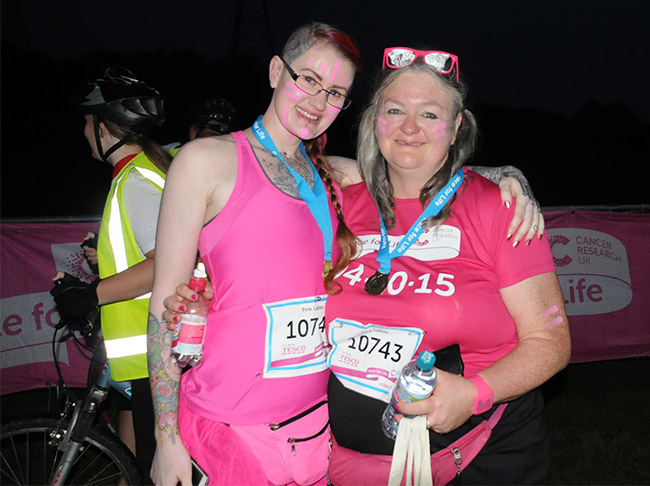 On Sunday, we BOTH completed a Marathon at the 1st ever ALL WOMEN UK Marathon in aid of Cancer Research. At 270 lbs I walked non-stop (except for peeing) for 8 hrs and 45 minutes to walk 26.2 miles. 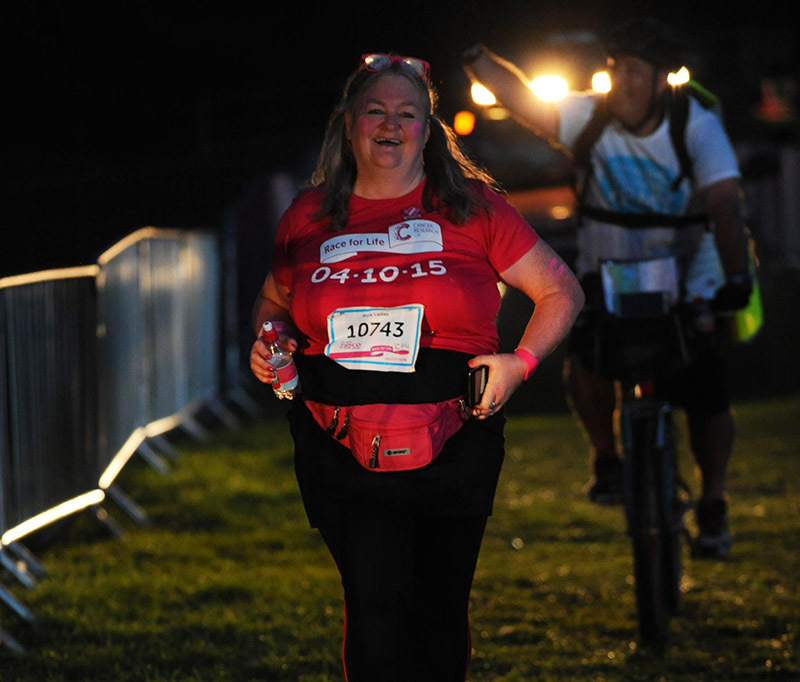 I started at 10 in the morning and finished LAST in the dark but I NEVER gave up. Don’t EVER let anyone tell you that because you are a fat girl you can’t do something athletic. YOU CAN!!! Just six months ago I could only walk 1/4 of a mile at a slow pace before having to sit down because of crushing back pain and general unfitness. This was because I weight had crept back up to 310 lbs. One of my goals by the time I got to 50 years old (I’m now 49) was to do a Marathon. On the spur of the moment, without little thought I signed my daughter and myself up as it was not only a huge challenge but it was for Cancer Research, something we are passionate about. I also signed my daughter and myself up to Pure Gym, we’ve spent more bonding time together which to be honest I’d missed. As the weight started coming off the back pain got less, I was able to walk for longer on the treadmill. First it was 10 minutes at 4 kmh, then after a few days 15 minutes then 20. As my muscles began to get stronger and confidence grew and my weight continued to drop my speed went up to 5 kmh then 5.5 kmh and then even 6 for short periods of time! Once I could walk on the treadmill for an hour at 5 kmh we began going for long walks in parks most weekends. We started using free apps like Runkeeper and MapMyWalk on our phones to track our distance and pace. Walking outside is harder work than the treadmill as you encounter different types of terrain and undulations and it’s fascinating to see afterwards what you’ve achieved…. it’s really encouraging! Going for one long walk at the weekends in addition to 3 treadmill sessions at the gym per week really helped us build up stamina and also really helped with losing weight (slowly but surely). It’s also a GREAT way to enjoy scenery by doing our walking in the various free parks we have in Nottinghamshire and South Yorkshire, and an ideal opportunity to breath in fresh air and get happy and feel the sunshine on our skin! 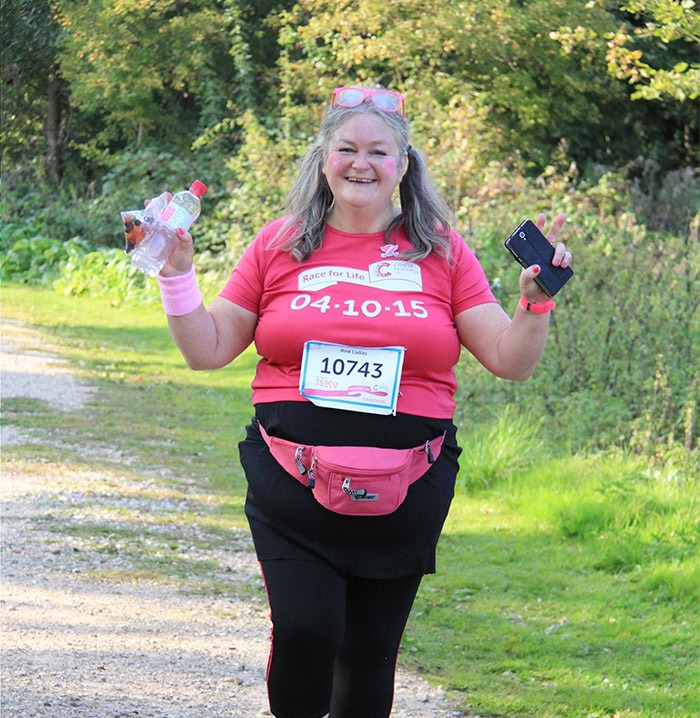 Just 4 months into our training we managed to do a 15 mile walk in 4.5 hours and it was at that stage we dared to hope that we actually REALLY COULD achieve the Marathon goal..
Part 2 (coming soon) – Big person foot injuries and set backs and the day of the race!